*PLEASE NOTE - Limited training slots for 2019. Shifting towards more lessons and less training as the year progresses. Waiting list in tact, please contact me to see about the wait list or for referrals. Please check out my referral trainers under outside services. What is the best learning situation for any of us? The answer generally is a learning environment with positive re-enforcement, exercises that make learning fun, doing lessons that are in the students capability, and building lessons from basic ground level concepts to advanced concepts. The student needs a teacher that is knowledgeable and experienced in order to put together the perfect learning situation. This idea applies to not only human students, but equine students. Full time training - Includes 5 sessions a week with one of them being a lesson, so you can learn and grow with your horse. Maintenance - Includes 3 sessions a week, with one of them being a lesson. For horses that are already going well and need to maintain skills and muscling. Is your horse due for a trim or will he need shoes? Is your horse sound and healthy including vaccinations and de-worming? Have you had your horses teeth checked for sharp points or wolf teeth? Please check with your farrier and veterinarian in advance and plan ahead! If you have any questions about the proper training program for you and your horse's needs, please contact me to discuss them. There is no such thing as a 30 day wonder. Just as we went to school for years and years to remember everything that we know, horses benefit exponentially from allowing them a little more time to learn and understand things. Sure, we can cram a lot of information into a horse, but cramming upsets their mental balance. I am available to discuss programs and finances to make sure you and your horse both win. What will your horse get out of their training? 30 days - in 30 days, the horse settles into the facility and learns the program. They learn how to look for release and how to better their try. They begin building appropriate muscles. This is the place where everything begins and that they can get their mind in the game. Bad habits they may have start to fade away. Everything begins to happen here, but the horse has not made the new things they have learned a way of life, so anything they learn could be easily lost if they go home and things are not accurately re-enforced. 30 day programs are best suited for horses that are trained and just need to improve a thing or two. 60 days - As horses are in their second month of training, they begin to be more solid on the requests made on them. They have been asked how to carry themselves long enough that they begin to start looking for the proper frame. Their muscles are building and it is becoming easier for them to hold themselves together. A try is better understood and they look for ways to try. Horses on the trail at this point learn to seek guidance from their rider more than reacting to stimulus around them. 60 day programs are good for people that want their horse to start really processing and absorbing the learned information when they go home. Old habits have been replaced with new, improved habits. 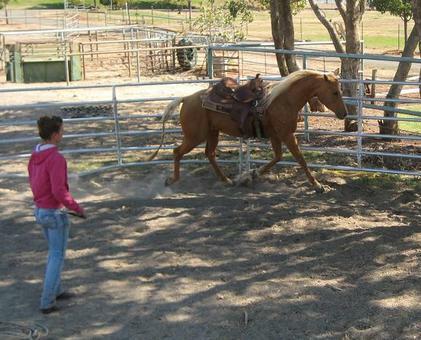 These horses are generally broke and need to improve their mental and physical state of mind. Some young horses can benefit from a 60 day program, but they are still not solid at all and would need to go home to a confident rider. 90 days - After 90 days, the horse is feeling pretty good about things. Physically, he is able to do what is asked of him. His muscle memory is much improved. Mentally, he is looking for what the rider is asking of him and even if the rider gets their cue a little wrong, he may be solid enough to start filling in for them. You can start putting a neck rein on him or using more "adult cues," and he will understand the aids enough to get it. He is focused enough that he will listen to the rider without being distracted by the stimulus around him. This is the best program for someone that wants to really help their horse be solid and make their riding career fun and more care free. This also is the most beneficial route for horses being started in the long run. With a solid foundation, the horse will always have something to fall back on. This is purely a rough guideline of how horses learn from their training program. The biggest thing I would like to stress is there is no such thing as a 30 day wonder. 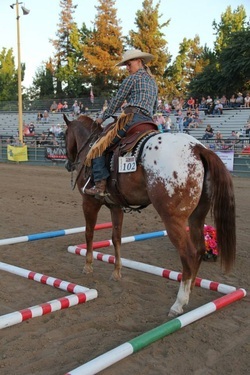 Horses put in training for 30 days will learn, but if they are not where they need to be or the goals are two high, either the owners goals will not be met or stress will be put on the horse and trainer to try and make the owner happy. Even for my example, 90 days is not the end of the road, this purely gives an idea as to how the learning process evolves. Think about your school career. If you lived 80 years, you would have gone to school a minimum of 16% of your life. If a horse was to live to the age of 25, 16% of his life would be 4 years. If we expect the most out of our horse, we have to allow them the time to learn, so they can be pleasant and proficient in their work and we can be safe and enjoy the ride. Traditionally, I have started a lot of young horses and put them on their road to success. However, I don't want to forget mentioning that life is a journey and there is always something to learn along the way. After a young horse receives their elementary education, they continue on to specialty work, which is where we think, what do you and your horse want to per sue together? Aged horses still need periodic tune ups, whether it be just to get them in shape, learn a new skill, or finesse their manners or handling. Continued training for the older horse that is already ride able ranges from show prep and learning how to execute maneuvers to be successful in the show ring, having your horse be mentally and physically available to help you be a better rider, more safe on the trail, or just find new things to expand their mind. Sometimes, continued training means going back and working on things that the horse should have learned when they were young and never did! No matter the scenario, we can work together to make you and your horse a better team.